She has been begging me for some Mommy/Daughter time so yesterday we had a great time! 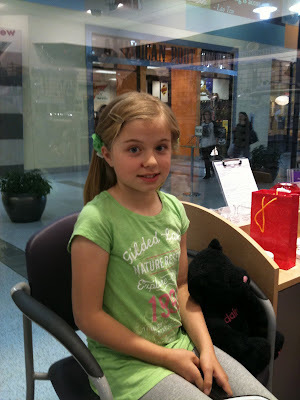 We shopped, eat out and wait for it....got her ears pierced. This was not part of the original plan but she asked me if she could and i really did not see a reason why she couldn't so, the rest is history. I did check with Mike before just so he was okay with it too! She looks terrified so of course I had to take a picture. She did great though, I will admit that I was a little worried that she might freak out. 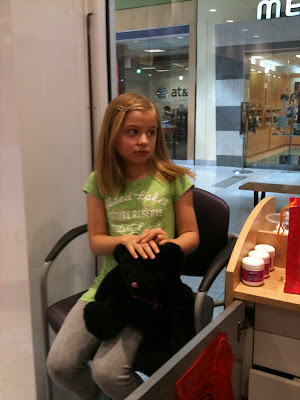 Happier with her new October birthstone studs. She picked them out herself. She was too funny telling me that she wanted something small and not flashy. That's my girl! 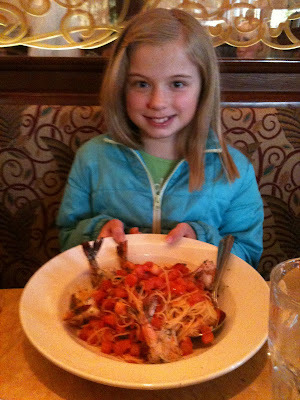 Hailey no longer wants anything off the kids menu :) She is a foodie and loves to cook and bake. She was so happy with her giant shrimp pasta dish. There is still about 1/2 left and she had it for dinner tonight to. Gotta love the Cheesecake Factory! 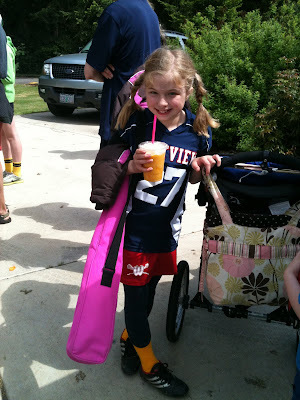 In other news Hailey played lacrosse this year and really loved it. Her season ended last week and she is hoping to continue playing. I do love that they wear cute little skirts!